Maintain compliance with the most current Interagency Appraisal and Evaluation Guidelines and improve accuracy and efficiency in property assessment with the use of automated valuation models (AVMs) combined with the RealCondition Report™ to create compliant Evaluations for permitted uses. 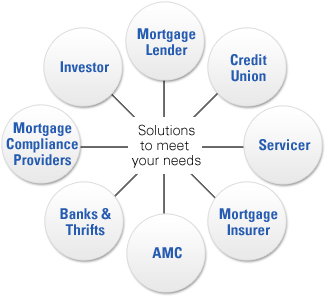 Our role as an independent provider of innovation- and technology-driven risk mitigation and workflow efficiency solutions for the mortgage industry allows us to offer a premier suite of AVM products with the highest level of accuracy and transparency. With an extensive selection of AVM products and a client-centric approach, we have the resources and technology to help clients secure the best and most accurate valuations in their specific geographic markets and for their specific needs. Gain access to high quality valuations instantly, and in real-time. Our proprietary OptiVal™ technology is the industry's premier AVM cascading solution that ranks AVM valuations to provide insight on the best and most accurate valuations. Our RealCondition Report™ is a comprehensive analysis and assessment of the current property condition of the subject property and its neighborhood derived from onsite inspection of external structural components of the subject compared to nearby properties. RealCondition Report™ determinations are made according to the Standards of Practice of the American Society of Home Inspectors (ASHI) and can be obtained in as little as 2 days.